Sophomore Hannah Hejlik answers a quiz question using the math department's new Mimio student response system. Junior Ariel Wilson works through a math problem projected up on the board through the Mimio system. The students answered the questions using the recently purchased student response system. Sophomore Levi Eden answers a math problem using the new student response system purchased through the Hancock County Foundation. Junior Ariel Wilson works through a math problem while using the new student response system. Math teacher Susan Carlson checks to see how many students have responded to a quiz question using the new student response system. BRITT - Math has been a little more fun this week thanks to some new technology. "It's more like a game and that's what I like about it," West Hancock junior Ariel Wilson said about the math department's new Mimio student response system. "It's something new and it makes it easier to learn math." The Mimio voting system was recently purchased for the math department through the Hancock County Foundation grant. Math teachers Michelle DeHart and Susan Carlson have been using the new system in their classrooms for the past couple weeks. DeHart said the student response system was something the math department had been looking at for awhile. "We thought it would be the best way to get an immediate response to what the students are thinking in the classroom," she said. The student response system is connected to the math department's current Mimio system, which connects to a computer and projects the software onto the whiteboard. Carlson said the response system can be used to create any type of quiz. The questions are projected through the Mimio system onto the whiteboard and the students answer using a handheld device. Carlson likes that the system is anonymous, allowing her to see what the students actually know. The system also allows her to see if the students are retaining what she is teaching day to day. "It's a great way to start the class period. I can double check if the students got the main concepts from the day before," Carlson said. "If the majority didn't understand it, there can be an instant decision to go back and reteach it." DeHart said the response system is a much faster way to gauge whether the students are learning the information. "When I project a question on the board and I get four different answers, it gives me an instant idea that I need to review that more," she said. "With worksheets, it's two or three days until the students get them back. The moment of learning has passed." 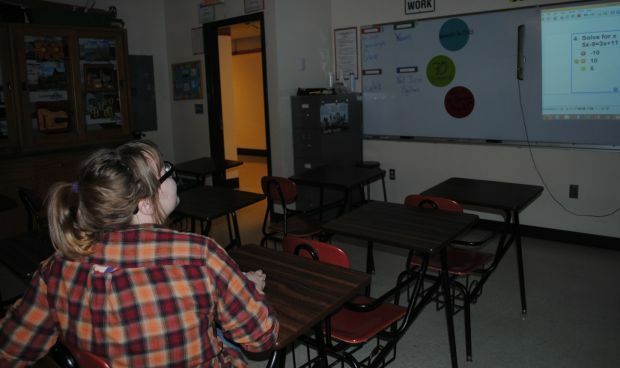 "I hope through increased usage with the Mimio system, it will change what we do in the classroom," she said. "We want to be able to hit more kids so they understand the content right away. That's the hope." Wilson is already noticing a difference in how she is learning. "I've never been good at sitting down and doing a worksheet. (The devices) make learning more engaging," she said. "I think because I know how to do the problems and it's like a game, it's easier to do the same problems when it comes to a worksheet," she said. 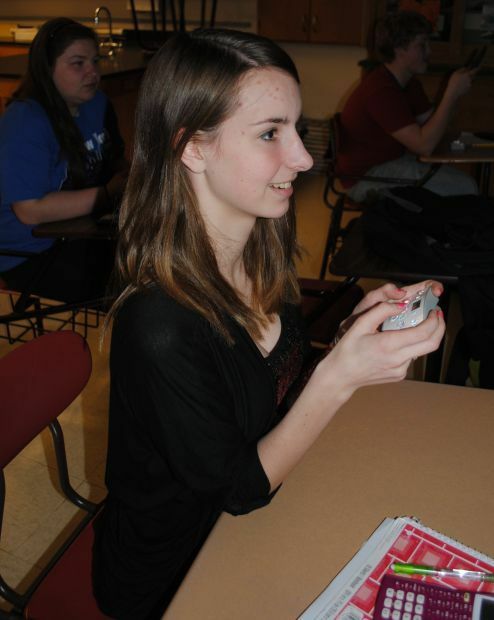 Sophomore Hannah Hejlik has also seen an improvement in her learning abilities. "I like the interactivity with it. When I see the problems up on the board, I learn it better," she said. "When she (Carlson) walks through a problem, it makes it easier for me to understand math better." And it makes learning more enjoyable, she said. "It's really fun to use the devices," she said. "It's a fun way to get math done."